This indicative offer was derived from the most recently booked accommodation in Aleksandrovka and sort by the price, from cheapest Aleksandrovka accommodation to the most expensive hotels. To select accommodation by your preferences we recommend to choose from 1 accommodation offers in Aleksandrovka in total. By entering the dates of your overnight stay in Aleksandrovka and using the filter tools you can sort the best possible accommodation for you. The entered dates of your stay are crucial for the most accurate offer as it derives all the online information on pricing and availability of Aleksandrovka accommodation. Then you can book the selected Aleksandrovka lodging (hotels, apartments etc.) immediately. Cottage Melnitsa Rantala is a six-bedroom country house with a sauna and swimming pool, located on the shore of Pionerskoye Lake in Aleksandrovka, Leningrad Region. Here you can meet rabbits, turkeys, geese and chickens. Providing lake views, Baza otdikha Ozernaya in Mysovoye provides accommodation, a private beach area and a terrace. A Full English/Irish breakfast can be enjoyed at the property. 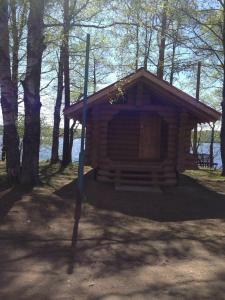 Offering a barbecue and views of the lake, Baza otdykha Shale Royal is set in Krasnoflotskoye. Zelenogorsk is 30 km away. Located in natural surroundings in Klevernoye Village, 300 metres to Krasnogvardeyskoye Lake, Chalet Ray Holiday Home offers self-catering accommodation with free WiFi. Free private parking is also available. Baza Otdyha Makslahti is set in Pribylovo and has ski-to-door access and a private beach area. Among the various facilities are barbecue facilities and a terrace. Апартаменты “BEREG” is offering accommodation in Primorsk. All rooms boast a flat-screen TV with satellite channels and a private bathroom. Guest House na Vyborgskom Shosse is situated in Primorsk. Free WiFi is featured. Offering a private beach area and a tennis court, Rannalla is located in Utkino. The self-catering villas offer 3 bedrooms and can each accommodate up to 8 guests. Set in Polyany, Avrora Club offers ski-to-door access. The accommodation offers a private beach area, as well as a garden and a terrace. Offering a sauna, Viking House (Yagodnoye) is surrounded by a pine forest in Yagodnoye. Located by a lake, the house offers a balcony, wooden furniture and a fireplace.